Editors: James Sibree, Richard Baron, and George Cousins. Additional Contributors: William Edward Cousins, Lars Dahle, J. Richardson, George A. Shaw, Robert Toy, Henry E. Clark, Herbert F. Standing, James Cameron, C. F. Moss, and C. Staniland Wake. London Missionary Society Press (1885). 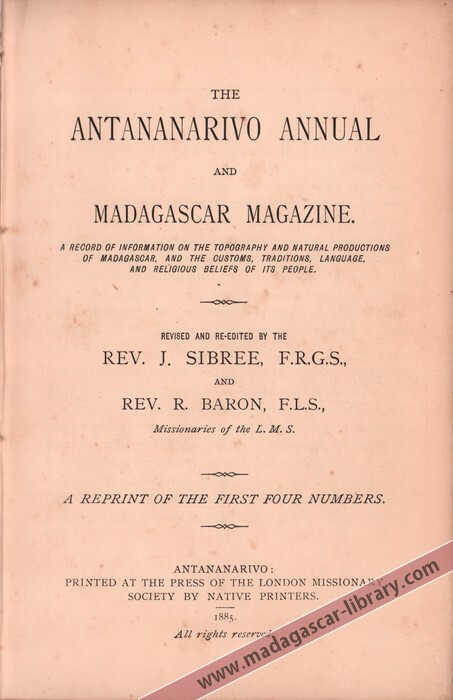 The 1875, 1876, 1877, and 1878 issues of the Antananarivo Annual (nos. 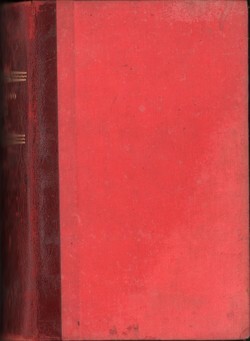 I, II, III, and IV) bound into a single volume. 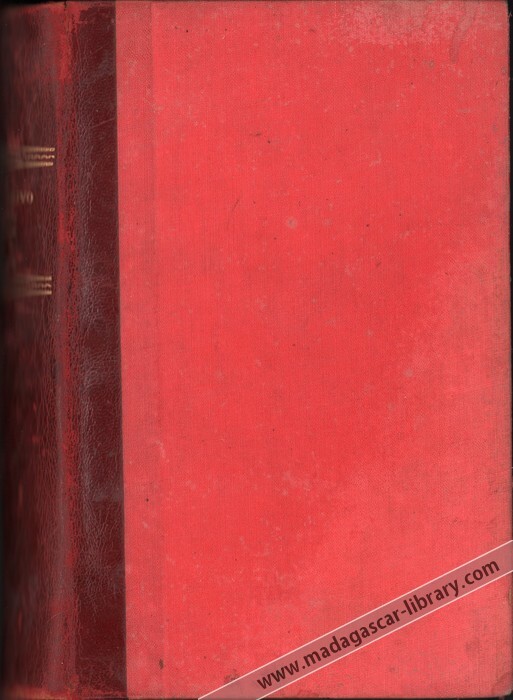 The volume has a single table of contents and index covering all four issues, and is paginated so that numbering runs in a continuous sequence through the volume. The four issues were first published at Christmas in their respective years. Our Object and Aims. By the Editor. The Ancient Theism of the Hova. By Rev. William Edward Cousins, L.M.S. Journal of a Visit to Mojanga [Majunga] and the North-West Coast. By Rev. Harry W. Grainge, L.M.S. The Malay Affinities of the Malagasy Language. Two letters from Rev. J. Duffus and Rev. W. Dening to Rev. William Edward Cousins. The Journey between Antsihanaka and the East Coast. By Rev. Joseph Pearse, L.M.S., and Mr. R. Aitken. The Late Mr. James Cameron: His Life and Labours. A Funeral Address by Rev. Robert Toy, L.M.S. Farahantsana, Itasy, and Ankaratra : Scraps from a Notebook. By Mr. William Johnson, F.F.M.A. With a map of Lake Itasy. Notes on Ikongo and its People. By Mr. George A. Shaw, L.M.S. Remarkable Burial Customs among the Betsileo. By Rev. J. Richardson, L.M.S. From Twilight to Gross Darkness. Being chiefly a narrative of what happened on the way, in a journey to Ankavandra and Imanandaza. By Rev. W. C. Pickersgill, L.M.S. Ambondrombe and its Ghosts. By Rev. William Edward Cousins. Drury's "Vocabulary of the Madagascar Language," with Notes. By Rev. J. Richardson. The Burning of the Idol Ramahavaly. Translated from a native account. By the Editor. Notices of New Books on Madagascar. Brief Summary of Important Events in Madagascar during the Year 1875. By the Editor. List of English Books, Pamphlets, and Papers on Madagascar. By the Editor. 'Heavenly Princesses'. By Rev. William Edward Cousins. Malagasy 'Sons of God'. By Rev. William Edward Cousins. Ice in Madagascar. By Henry E. Clark. Native Account of a Tribe Called 'Kalio' or 'Behosy'. By Rev. William Edward Cousins. An Early Sonnet on Madagascar. By Sir John Suckling. On a Hitherto Little-Noticed Use of the Particle 'No'. By Rev. James Sibree. Gleanings from "Livingstone's Last Journals". By Rev. William Edward Cousins. The First Arrangements for a Protestant Mission in Madagascar. By Rev. James Sibree. The Zahana. By Rev. J. Wills. Madagascar Tortoises. From the Illustrated London News, July 3rd, 1875. Our Second Number. By the Editor. Over Swamp, Moor, and Mountain: Being the journal of a visit to Antongodrahoja, and home by Ambatondrazaka. By Rev. C. F. Moss, L.M.S. Words Resembling Malagasy in the Swahili Language. By Rev. William Edward Cousins. Malagasy 'Tonon-Kira' and Hymnology. By Rev. J. Richardson. The 'Infix' in Malagasy: A Malayan Feature. By Rev. Lars Dahle, N.M.S. The Western Ibara and their Customs. Translated by the Editor. A Visit to Ambohimanga in the Tanala Country. By Rev. T. Brockway, L.M.S. The Ghosts of Ambondrombe Laid. By Mr. George A. Shaw. Madagascar Two Centuries Ago: Proposal to make it a British 'Plantation'. By Rev. A. B. Grosart, Blackburn. Carving and Sculpture and Burial Memorials amongst the Betsileo. By the Editor. Dr. Mullens and the Population of Antananarivo. By Rev. J. Richardson. The Influence of the Arabs on the Malagasy Language: As a test of their contribution to Malagasy civilisation and superstition. By Rev. Lars Dahle. Tanala Customs, Superstitions, and Beliefs. Collected by Dr. A. Davidson and translated by Rev. J. Richardson. Rough Sketches of a Journey to the Ibara. By Mr. George A. Shaw. Malagasy Conundrums. Collected by Rev. J Richardson. Hova, Tanala, and Betsileo Names of the Months. By Rev. J. Richardson. List of Foreign Books on Madagascar, Chiefly in the French Language. By the Editor. A Malagasy Ordeal. By Rev. James Sibree. Sakalava Marriage Custom. By Rev. T. Brockway. The Cyclone of February Last. By Rev. James Sibree. Ants and Snakes. By Rev. Robert Toy. Earthquake Shocks. By Rev. James Sibree. The Zahana. By Rev. Robert Toy. Malagasy Boats. By Rev. James Sibree. The Filao Tree. By Rev. Robert Toy. The Voavotaka. By Rev. Robert Toy. Brief Summary of Important Events in Madagascar during the Year 1876. By the Editor. On the Early Inhabitants of Madagascar. By the Late James Cameron, Esq., L.M.S. Maps of Madagascar. By the Editor. A Short Cruise on the North-Western Coast of Madagascar. By Bishop Robert Kestell-Cornish, S.P.G. Notes on the Antankarana and their Country. By Rev. R. T. Batchelor, S.P.G. Sir William Davenant's Poem of 'Madagascar'. By Rev. R. Auchterlonie, Edinburgh. Ifanongoavana: The Ancient Seat of the Hova Kings. Translated by the Editor. Studies in the Malagasy Language. Nos. I and II: On Accentuation; On the Reduplication of Roots. By Rev. Lars Dahle. The Sihanaka and their Country. Translated and adapted by the Editor. Notes on the Traveller's-Tree. By the Editor. Hova Decorative Art. By the Editor. The Betsileo: I. Country and People. By Mr. George A. Shaw. Hindrances to the Progress of the Gospel in Madagascar. By Rev. C. F. Moss, L.M.S. Notes on 'Davenant' and 'Boothby.' By C. Staniland Wake, Esq., M.A.I. The Folk-Lore of Madagascar. Specimens of Malagasy Folk-Lore. By Rev. J. Richardson. A Missionary Tour to the East Coast. By Rev. Charles Jukes and Mr. T. Lord, L.M.S. A Sakalava Custom. By Rev. James Sibree. Madagascar Serpents. From North-east Madagascar, pp. 35, 36. A Waterspout. By Mr. William Johnson. Notices of New Books and Pamphlets on Madagascar. Brief Summary of Important Events in Madagascar during the Year 1877. By the Editor. The Discovery of Madagascar. From "The Life of Prince Henry of Portugal"
The Betsileo: II. Religious and Social Customs. With a lithograph. By Mr. George A. Shaw. The Malagasy Language A Member of the Malayo-Polynesian Family. By Rev. William Edward Cousins. Marco Polo's Description of Madagascar. With Col. Yule's Notes. By Rev. James Sibree, Jun., L.M.S. Malagasy Proverbs. By Mr. Samuel Clemes, F.F.M.A. The Bezanozano or Bush People. By Rev. P. G. Peake, L.M.S. More Folk-Lore. By Rev. J. Richardson. The Sakalava: Their Origin, Conquests, and Subjugation; A chapter in Malagasy history. By Rev. James Sibree, Jun. Remarks on the Meteorology of Antananarivo and the Neighbourhood. By Rev. Robert Toy. Studies in the Malagasy Language. No. III: On the 'Inflection' of the Verb in Malagasy. By Rev. Lars Dahle. Jottings on some of the Plants of Imerina. By Rev. Richard Baron, L.M.S. Names of the Malagasy Days of the Month. By Rev. Lars Dahle. The 'Stone Elephant' at Ambohisary. By W. D. Cowan. Malagasy 'Sons of God'. By Mr. C. Staniland Wake. Madagascar Lichens. By Rev. James Sibree, Jun. Madagascar Ferns. By Rev. James Sibree, Jun. Malagasy Names for the Months. By Rev. J. Richardson. Scraps of Folk-Lore. By Rev. J. Richardson. Brief Summary of Important Events in Madagascar during the Year 1878. By the Editor. Issues I, II, and III were edited by Rev. James Sibree, F.R.G.S. and issue IV was edited by Rev. George Cousins. This reprint was revised and re-edited by Rev. James Sibree and Rev. R. Baron, F.L.S. In addition to pieces written by the editors, this work includes contributions from the following authors: R. Aitken., Rev. R. Auchterlonie, R. T. Batchelor, Rev. T. Brockway, James Cameron, Henry E. Clark, Samuel Clemes, William Deans Cowan, Rev. Lars Dahle, Rev, W, Dening, Rev. J. Duffus, Rev. Harry W. Grainge, Rev. A. B. Grosart, William Johnson, Rev. Charles Jukes, Bishop Robert Kestell-Cornish, T. Lord, Rev. C. F. Moss, Rev. P. G. Peake, Rev. Joseph Pearse, Rev. W. C. Pickersgill, Rev. J. Richardson, George A. Shaw, Rev. Robert Toy, C. Staniland Wake, and Rev. J. Wills. This item was kindly donated to the Madagascar Library collection by Andrew Carpenter.